There are several methods of granting Access through a door, turnstile, Barrier or anything you wish to control movement of people or vehicles through. 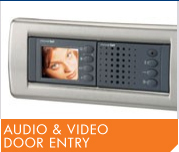 However, whilst most manufacturers supply their own readers and reading technologies, unlike the Networked Access Control Door Controllers they are generally not unique, or only need a slight modification, to work with the various controllers or software using a common Wigand format. 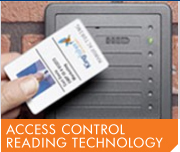 There are a number of different methods of granting access such as Proximity, Contactless, PIN, Swipe (although now rarely used in new installations) Electronic Key, Fob, RFID, ISOprox and different types of Biometrics. Readers come in all shapes and sizes such as a small Mullion to larger and longer range or hidden Architectural readers and many others in between. 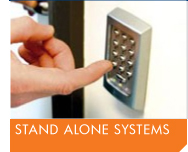 All points of entry need to be secured either by internal mechanisms on Turnstiles, or Barriers for example or by the fitting of locks in the form of Latch releases, Electromagnetic devices, Shearlocks, Deadlocking Solenoidbolts and ShootBolts and selecting the right product is very important. 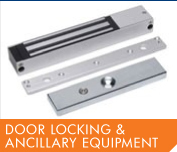 Fortunately we have access to a large number of manufacturers such as Abloy, Trimec, ASSA, SSP, Dryad Deedlock, Alpro. Most of these locks incorporate door monitoring devices to sense if a door is forced, held open and even if the door is secure. This information is transmitted back to the door controller and from there a central or local alarm can be triggered. If exit from the secure area is to be by a non card means we can supply a range of different devices such as Proximity, Exit PIR’s, Stainless Steel, Heavy Duty, and DDA Compliant buttons. In the event of an emergency a simple emergency door release breakglass unit, similar in design to a Fire Alarm callpoint but in White or Green, is fitted to provide a failsafe method of exit. Again these can be monitored to alert the someone when they have been activated. Paxton Access - Switch2, Touchlock, Cardlock & Easyprox. Kantech – IOPASS. PAC – Keypac Solo, Easykeu & Easykey 1000. ACT – ACT5, ACT10, ACTentry, ACTsmart, & ACT5Prox. TDSI – Sologarde. & Impro – Supergate Lite. 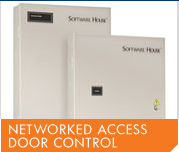 Most of these systems would need to be programmed locally to the door controller and so they would be unsuitable for sites with a large number of doors and users due to the time spent programming them in and the ongoing management of the system. 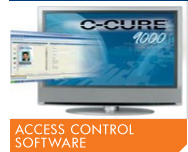 As mentioned in the Electronic Access Control Software Systems section of this site many of the software solutions can be purchased with the ID card option to integrate your user database with ID card production via a Dye Sublimation Card Printer. Alternatively, we can supply a set up for you a stand alone ID Card Production Software package completely separated from the Access Control Software. ID cards can be printed directly onto a suitable ISO Access Control Card or onto a standard PVC card for visitors or staff not issued with Access control rights. 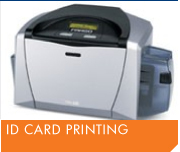 There are several different types of card printer from the most basic single sided to more complex fast double sided printing with a high security hologram overlay. Typical units we can supply are the Fargo – Persona, DTC400EAssure ID Solo, Assure ID Express, Assure ID Enterprise, Assure ID Exchange, DTC550 & HDP5000 & NBS Javelin – J100, J120i, J330i, J360i, J430i, JX, CX-330, ZXP Series 8 & CX-D80.